Read how Sophie Davies fell in love with yoga while on holiday, and six months after finishing her degree, launched Firefly Yoga. 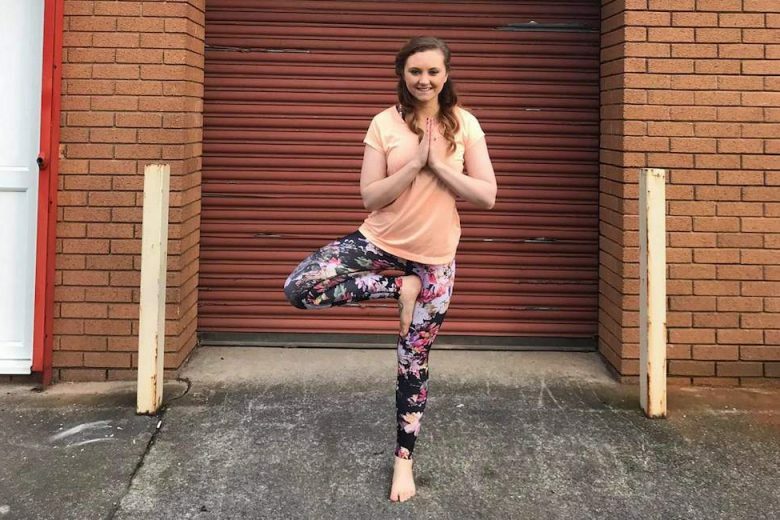 I graduated from the University of St Andrews in June 2017 with a degree in Economics and Management, six months later I took a leap of faith and started my own business, Firefly Yoga. The only previous experience I had was running a small craft business on Etsy during my time at university. While this wasn’t a full-time job it taught me a lot around managing stock, dealing with buyers, marketing and general business admin. I’d always had a goal of setting up my own business and this was quite a nice introduction into the world of business and let me learn by doing. Even if I didn’t realise it at the time! I had done a few yoga sessions while on holiday before but only really got more acquainted with the concept at university. I quickly fell in love with yoga and set about on my teacher training journey. Where did the idea for Firefly Yoga come from? I first started going to yoga while in my third year at university. From the first class I was hooked and absolutely loved it. Fast forward a year, as with most final year students the thought of graduating and entering the real world is a bit daunting. I was going through the usual motions of looking for graduate jobs and so on, but nothing was really appealing to me. One day when I was attending my weekly yoga class, lying down in Savasana the thought just popped into my head, like it was starting me in the face the whole time. I could do this. I could open my own studio and teach yoga back home. The excitement and enthusiasm I had for this idea trumped any graduate scheme. I quickly discussed the idea with my boyfriend (now husband) and began looking into yoga teacher training providers. My partner and I decided it would be a good idea to do it now while we didn’t have children or any other large financial commitments. I planned out what I needed to do, training, studio location, looked into competition around our local area, basically everything. It was like setting up my Etsy store but on a bigger scale and a lot more exciting! I found a yoga training provider I loved and who’s course really spoke to me. I completed my yoga teacher training while studying for my last year of university. Upon graduating, I moved back home to Cwmfelinfach, South Wales and began looking for venues and trying to secure funding. My studio opened six months later. Our USP is that we are the only dedicated yoga studio in the South Wales Valleys. We’re open seven days a week with classes morning, daytime and afternoon. Furthermore, we also allow children aged over five to attend certain classes which really helps people who struggle with childcare to fit in exercise. One of the best things about my studio is the community that has been built over the past year. Everyone is just so welcoming andlots of new friendships have been formed. I even have to shout to get the class going sometimes as they’re all so busy chatting with their yoga friends! We’ve also had some successful events outside the studio too. We went on our first yoga Christmas meal and are planning our first yoga retreat. One of the things that I wish wasn’t so prevalent is the stereotypes around yoga. You may be expecting me to say our target audience is young flexible athletic women. That couldn’t be further from the truth. Our target audience is very broad, men and women aged 18-70+ who simply want to get more flexible, improve their balance and relax. One of the first things I did when my studio opened was create a website and set up a Google My Business Profile so I could at least be found. As we are a local studio most of what we do involves local marketing. I also had some leaflets printed and delivered to houses close to the studio. While we use social media (Facebook and Instagram) as well as our website, word of mouth is our biggest advertisement. Many people come along because its been recommend to them by a friend, family member, colleague etc. Our best strategy is the combination of local SEO and PPC. While I learned the basics of this running my Etsy store, I really wanted to focus on providing the best classes for my students. So, I decided to outsource this to a specialised digital marketing agency called Dandy Marketing. At the moment we are targeting those searching yoga related keywords within a 10-mile radius of my studio. It’s working really well and driving a lot of footfall and enquires. Anything with radius targeting normally works quite well for me. My biggest hurdle was definitely self-doubt. Our planning permission was delayed and as a result we didn’t open until the end of November, not the best time to be starting a fitness business! The first few weeks were extremely quiet, and I began to worry I’d made a huge mistake. I had to have faith that we would continue to grow as the months went on – which we did! I love seeing people making new friends, encouraging and complimenting each other on their progress. The whole vibe with my studio is exactly what I wanted it to be. I love my job because I love yoga and I want to share that love with as many other people as possible. Yoga is a great exercise for everyone. It can be a gentle introduction to exercise for someone who hasn’t exercised before, is recovering from injury or is post-partum. It can also be fabulous to counteract the strain of training for athletes like runners and cyclists. Furthermore, in this ever-stressful world it’s important to give people a space and time for them to relax and switch off. I love being able to create this time and space for everyone. My students inspire me every day. Getting testimonials like that one above is an unbelievable source of inspiration that just adds fuel to the fire. It can be little things as well, seeing someone sticking at a pose they are struggling with and finally mastering it. Even someone who tries yoga for the first time and stays behind to ask questions on how to improve. My husband I make sure to spend quality if not quantity time together. He works a ‘regular’ hour’s job so as I’m out in the evenings it can sometimes feel like we’re ships passing in the night. I teach classes seven days a week, but I always make sure to have set times where I can try to switch off and spend time with my family and friends. Therefore, we make sure to spend our Saturday afternoons and Sunday mornings together doing fun things that we both enjoy, going to the cinema, going bowling or going for a run. It may seem weird ‘fitting’ your friends and family in, but they will understand what you are trying to achieve. If you’re struggling with that at the moment just pick one day for a few hours where you can spend time with whoever you want, it’s really helped me. I often joke that I’m only where I am today because I am far too overconfident in my own ability. However, I do believe that self confidence is key, if you believe you can do it, can envisage yourself doing it you’re already half way there. While self-belief is important it’s also important to recognise that you can’t be a one-woman band. I would never have been able to open my studio without help from my family. My husband and all his hard work doing a lot of DIY, my grandad and his electrical skills on our very odd electrical circuits and my mums help with cleaning and décor! Opening your own business or being self employed is tough. There are some days I wish there was someone else who could make the hard decisions, so I didn’t have to. But its also greatly rewarding. A lot of people hate their jobs but being self-employed means, you get to do something you love. Anyway, its tough but its worth it, so pour your heart and soul into it and give it all you’ve got – it’ll be worth it! You can find out more about Firefly Yoga on their website.